Home › Lesser florican › Little bustard - Tetrax tetrax. The little bustard (Tetrax tetrax) belongs to the bustard family Otididae. 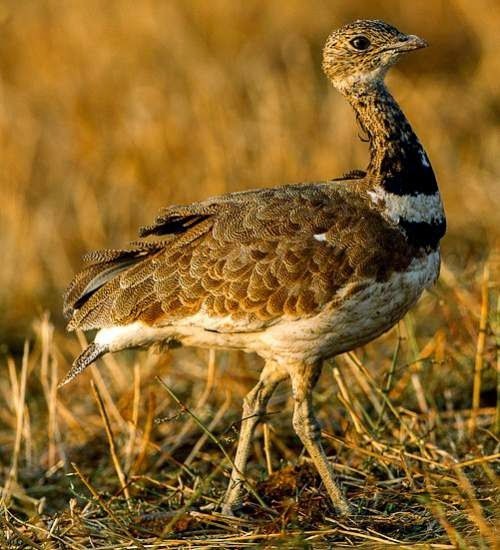 The little bustard species is distributed in southern Europe and western and central Asia. It is an occasional visitor to Indian Subcontinent. Tetrax tetrax was earlier included in the genus Otis. The little bustard is a smaller bird, the male being slightly larger than the female. The male bustard measures 43 cm in length and weighs 800 to 975 grams. The female bird measures 43 cm and weighs 680 to 950 grams. The breeding male is brown above and white below. Head is grey with a black neck bordered above and below by white. The non breeding male and female lack the neck border. The female little bustard is darker than the male. These bustard species inhabit open grasslands and undisturbed cultivation, with plants and grass tall enough for cover. These bustard species are omnivorous, feeding on seeds, shoots, berries, insects, small rodents and reptiles. The male bustard makes breeding displays with foot stomping and leaping in the air. Females lay 3 to 5 eggs in the nest on the ground. The female does the incubation of eggs and rearing of the chicks. The little bustard is distributed in Russia, Georgia, Kyrgyzstan, Kazakhstan, Azerbaijan, Ukraine, north-west China, Iran, Spain, Turkey, Portugal, Italy and France. Wintering birds occasionally move up to Indian Subcontinent. The little bustard populations in Southernmost Europe are mainly resident. Other populations in Europe and Asia migrate further south in winter. The global population of these bustard species has been estimated at a minimum of 260,000 individual birds. The decline in grasslands and low-intensity cultivation has directly contributed to sharp decline in the population. The habitat loss and poaching are the major threats in conserving these species. The IUCN (International Union for Conservation of Nature) has categorized and evaluated these bustard species and has listed them as "Near Threatened". Current topic in Birds of India: Little bustard - Tetrax tetrax.